We get asked every day to clip dog and cat nails. We’re happy to do it, but we’re also aware that sometimes it’s best to say no. Other times, it’s an absolute must, but must be done perfectly. Even after all these years nail clipping remains one of the most difficult jobs I do. You can do it but here are some things we want you to know first. What happens if nails are too long? Excessively long nails probably cause pain by forcing dogs to weightbear on their nail beds. Long nails also cause permanent toe deformity by twisting the toes into abnormal positions. 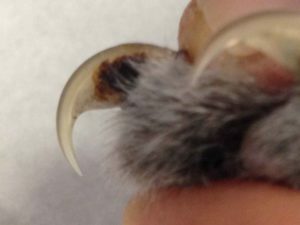 Cats’ nails can curl around until the sharp tips pierce the pad, causing pain and infection. Do all dogs need their nails clipped? The dog’s foot in the picture above is typical for a well-exercised mid-sized dog. It’s tempting to trim off the sharp tips, but look at the clear nail closest to us. Can you see how it’s pink all the way to the bottom? That’s the ‘quick’: cut it and you and your dog will be sorry. See why below. Most dogs’ nails don’t need trimming because they wear down naturally as they walk and run. Be very careful clipping your dog’s nails without first getting a vet to show you how. So why do some dogs need their nails clipped? Age. Older dogs and young puppies don’t get to walk as much as they need. Breed. Some breeds and individuals just have nails that don’t wear down well. Grass surfaces at home and in the park don’t wear down nails. Body size. most Chihuahuas need regular nail trims, St Bernards usually don’t. If you look at your dog, you’ll notice they have only four toes on the ground. On the front feet only* is a fifth toe which corresponds to our thumb. Because this nail sits higher, it doesn’t wear down as well, and often needs trimming to prevent a sharp or hooked tip. You can see the dog’s dewclaw here is sharp compared to his flat weightbearing nails. *Some dogs do have hind dewclaws which often lack the phalangeal bones and are even more troublesome. Except in specific breeds, we consider these an abnormality and recommend their removal at the time of desexing. We’ll tell you if you have a check up! To check at home, look at your dog’s foot in a normal standing position. Can you see that the outer nails are touching the ground, whereas the middle toenails are 1-2mm off the ground? This is normal length. If all nails touch, they are probably too long. 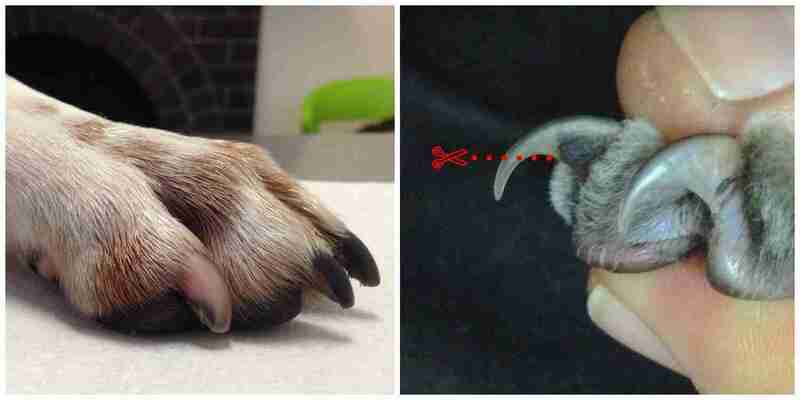 The dewclaw can be assessed by feel. If it has a curved or hooked end, it’s probably too long. How do I clip my dog’s nails? How Much to Cut? Warning: long nails can contain long quicks, especially in old animals. There is no way to be certain that you won’t cause pain and bleeding when cutting black nails. This is where experience counts. A ‘rule of thumb’ (pun intended) is that the nail end should be level with the flat of the pad. However, it’s best to go a bit longer and work back. Clear nails are easier. At least you can see the quick and stay away from it. Equipment: I only use scissor-type nail clippers, even on small dogs. It’s worth paying extra for good quality stainless steel blades. The guillotine-type clippers may look easier, but they have a nasty habit of trapping and twisting the nail. Technique: be confident, precise and fast. Once you choose the level, cut swiftly. This avoids the dog either trying to pull a trapped nail or moving the nail so you cut too deeply. How Often? Every three months. What happens if I cut the nails too short? The quick has a generous supply of blood vessels and nerves. If you cut it, the result is pain, a bloodbath, and a scared dog who is very unlikely to let you near their nails again. To stop the bleeding, we use a special styptic. At home, you can apply a ball of cotton wool to the nail and loosely tape it to the foot. The fibres in the cotton wool provide a framework for a clot to form. After an hour you should be able to remove it. See your vet if bleeding persists. 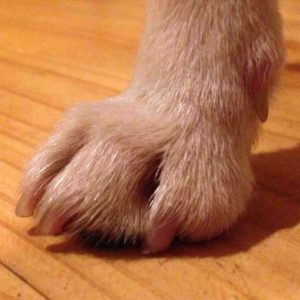 Once a dog has experienced a bad nail clip, they tend to be very anxious and try to jerk their feet away as you cut. This makes it all the more likely they’ll get another bad cut. We see lots of these dogs. Do cat nails need clipping? I always think of the Jaguar at Adelaide Zoo. We’d just darted him with an anaesthetic and after a checkup I set about trimming his giant claws, thinking I was doing a useful task. Dr Schulz said “steady on, he needs those”. He lived with a ferocious female and I have no doubt Schulz was right. It’s the same for cats. I won’t trim cats’ claws if they have outside access for two reasons: defence and agility. I don’t want them falling from a roof or tree because I took away their means of attachment. I’m happy to trim indoor cats’ nails. They won’t miss them around the house, and it spares the furniture, carpet, your best clothes and your skin. Older people, in particular, can get nasty skin wounds. The picture at the start shows the correct place to cut. How do cats sharpen their nails? Cats’ nails are very cool; they have layers like an onion, so that by clawing on a rough surface, the cat can unsheathe the older blunt later and expose a new sharp layer within. That’s why you find those thin nail sheaths around the scratching pole. They really are sharpening their nails! Once cats can’t or won’t use scratching posts, the nail sheaths start building up. Some cats, usually the elderly, need their nails trimmed to prevent them becoming ingrown. Ingrown nails should be checked by a vet. Not only are they usually infected, but the cats may be suffering from arthritis or other conditions preventing good mobility. How do I clip my cat’s (or ferret’s) nails? How Much to Cut: Just take off the thin part. Stay well away from the pink quick. 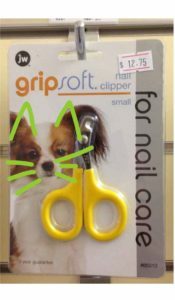 Equipment: The cat nail clippers (pictured) are the easiest to use and perfect for cats, despite the dog picture! Technique: you have to learn to push out your cat’s claws as shown. Most cats will only let you do a few at a time so I keep my clippers near where I sit with my cat. How Often? To prevent overgrown or ingrown nails, do it every three months. To prevent scratching of people or furniture, do it monthly. Is there an alternative to nail clipping? Some people have used Dremel-type tools. I can imagine a whole lot of things going wrong so I’m not so sure. If you’re patient you can always use an emery board. The best solution is to get a vet to assess and clip the nails to normal length. Then (if the vet agrees) you should be able to keep them short by daily walks on paved surfaces (dogs) or provide appropriate scratching areas (cats). We vets clip nails all day so we’re always happy to do it. It’s included free of charge in a full consultation, otherwise the charge is approximately half a normal consult fee if done separately.